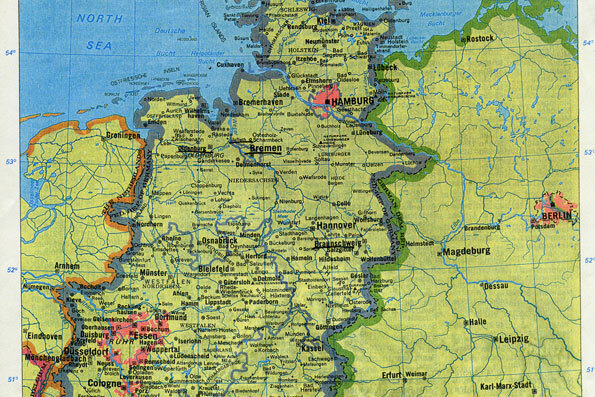 A map of the northern part of Germany, showing Oldenburg to the west of Bremen. 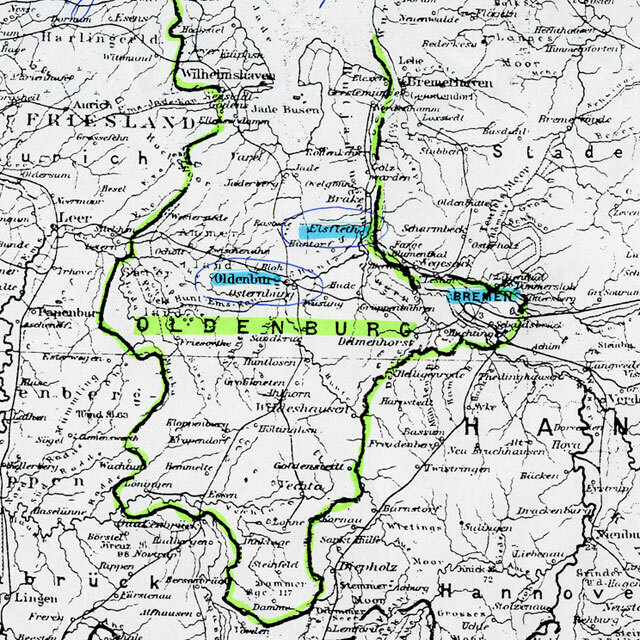 A map showing the Dutchy of Oldenburg and the towns of Oldenburg and Elsfleth. On the birth ceretificate of his son, Christian, born in Brookly, New York in 1883, Johann Petermann was listed as born in Oldenburg. Family history indicates that Sophie Steuer was born in the town of Elsfleth, Dutchy of Oldenburg. Bremen was a free city and not part of the dutchy. Bemen and Bemerhaven were magor ports in Germany. It is highly likely that the Petermanns immigrated to the US from Bremen. The Petermanns were living at 282 Conover Street at the birth of Christian in 1883. This address is marked X. The Petermanns moved to Hoboken, New Jersey by 1884. My husband, Tom Blanck, had relatives, the Kettlers, who lived on at 206 Richards Street on 1886 and at 87 Ferris Street in 1889. By 1891, they too had moved to Hoboken. 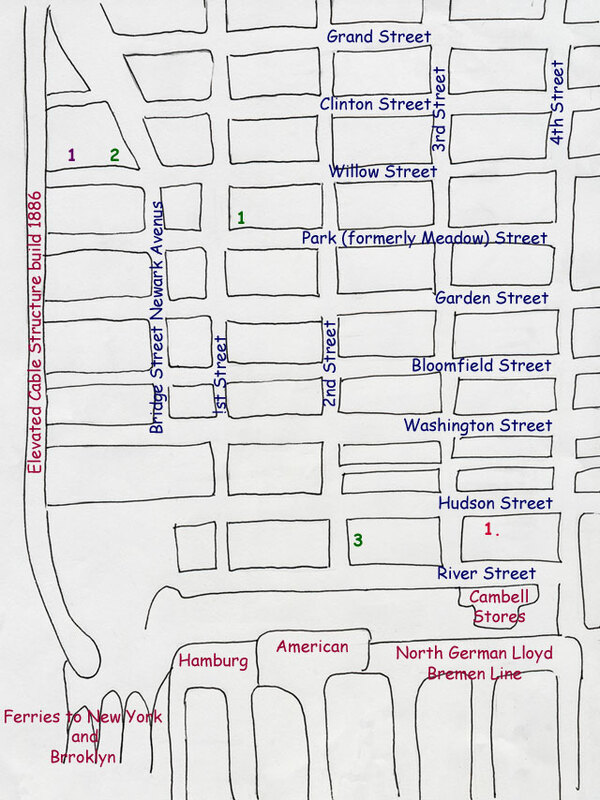 While there were neighborhoods of Irish and Italians in Hoboken, until the start of WWI, Hoboken had a predominantly German/American population. 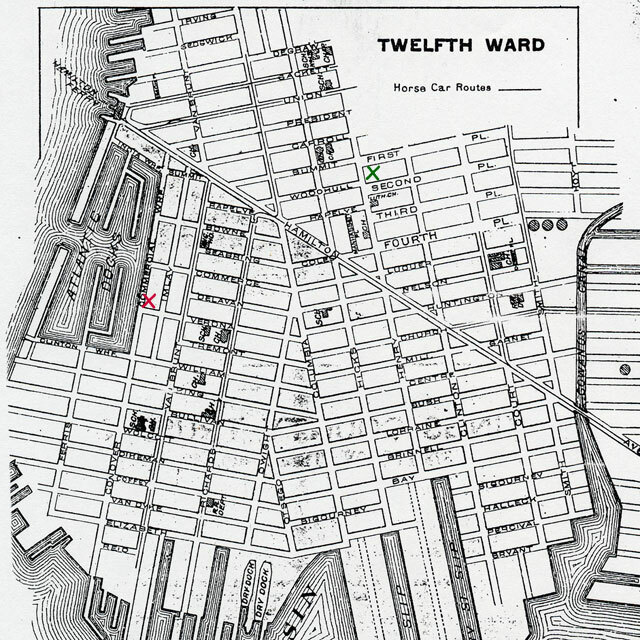 In the late 19th century Hoboken had one of the most thriving wharfs in the New York Harbor. It was the New York port for the North German Lloyd Line, the Hamburg American line, the Scandinavian-American line, the Wilson line and the Tietjen and Lang dry-docks. Importing and exporting made Hoboken an important warehousing and wholesaling center. Hoboken was the terminal for the Delaware, Lackawanna and Western Railroads and the Hoboken Shore Railroad. It was also an important point of embarkation for arriving immigrants. Hoboken is 16 blocks deep and 16 blocks wide. The east/west are shorter than the north/south blocks. I have only included that part of Hoboken where the Petermanns lived. From 1884 to 1886 they were at 101 Park Avenue. This was their address when William died in June 1886 and where I believe they lived when Meta was born in January 1886. From 1886 to 1887 they were at 65 Willow. This was their address when Annie was born in October, 1887. The last known address of Johann Bernard Petermann was at his death in 1909, when he was listed at 1101 Washington, which is not on this map. This address would be between 11th and 12th on Walshington Street. The purple number "1" indicates 43 Willow Street, the address of my husband, Tom Blanck's, great-grandparents, Henry and Melusine Blanck from 1882 to at least 1887. Tom's grandfather, Louis Blanck, was born at this address in May, 1887. This block of Willow Street was a short block. Did the Petermanns and the Blancks know each other in Hoboken in 1887? Since they both had small children it is highly likely that they at least had a nodding aquaintance. The red number "1" indicates the address of Percy Land in 1906. St Matthew's German Church (not shown on this map) is located at the corner of Hudson and 8th Streets. The train tracks for the New Jersey Transit, formerly the Eire Lackawanna railroad, now runs through the area that once was 63 willow Street.